Do Your Plants Know What You’re Thinking? Vegetable Garden Layout – Rows, Square Foot Or Wild? Yesterday morning, my sister had an interesting encounter with a sniffling boy and his grandmother. It prompted us to put together a short medicinal plants list of 5 plants you may want to consider for your own organic garden. While sitting on a bench at the park, a sweet, older woman sat down beside me with her grandson. The poor little guy had bright red eyes, a runny nose and was coughing up a storm. But grandma was armed and ready. She had tissues hanging out of every pocket and a purse full of remedies. Echinacea can be good medicine if you get a quality brand or grow your own quality echinacea. I doubt those candies offered much power, but I smiled and accepted her offer. Phil: Hey guys, it’s is Phil from SmilingGardener.com and today we have a medicinal plants list that we put together for you, and my sister is going to tell you why we started thinking about this. H: Well, okay, I started thinking about this yesterday because I went for a walk in the park right beside my house and I sat down on a bench to take a rest and this woman, an older woman, had sat down beside me and she had a little — her grandson with her. So it got me thinking that even across the ocean, there are a lot of plants that medicinally offer the same properties. So we thought it would be worthwhile to discuss some of them. Phil: Yeah and so we started talking about it and what it really reminded me of – and this is kind of the most important part of the blog we put together I think -that what got me really excited when I started studying organic gardening was the idea of growing really nutrient dense food and growing any kind of fruits, vegetables, nuts and seeds and mushrooms, whatever you do, if you can learn to create really good soil and grow that really nutrient dense food, then you are going to be getting just natural pharmaceuticals really; the same kind of stuff that are used in things like aspirin, anti-inflammatory things, all kinds of natural drugs really that will prevent disease and just help you be overall healthy. So I got really excited about that, but then we were talking about today and we were talking about how there are some plants that are especially medicinal. So what we did is we put together a list of five, we just picked five really that I have in my garden and that I have used in the last week or so. And to keep this video short, we are just going to cover one of them in the video and the other five will be on the blog. So if you are watching this on YouTube, I’ll put a link below and you can go, check it out. So many other ones are pretty cool; we have like a — we have a leafy green, we have a flower, we have a bulb, we have a weed. So we have some cool ones. But we are just going to about another one today. So H, you picked one that you really liked, right? H: Yeah, I thought it would be cool to mention fennel because fennel is really awesome for relaxing the tummy. It helps aid in digestion. So if you have fennel tea or phenol seeds, it’s really good to maybe, for example, get a cup of tea, have that before a meal or after meal, especially if you have something heavy, it’s really good to help settle the tummy. So if you’ve ever been to an Indian restaurant, you’ve probably seen that they have little dishes of seeds for you after dinner maybe covered in like a sugary coating, something like that. Well, those are fennel seeds and it’s a practice in India to eat them after a heavy meal to help aid in digestion. 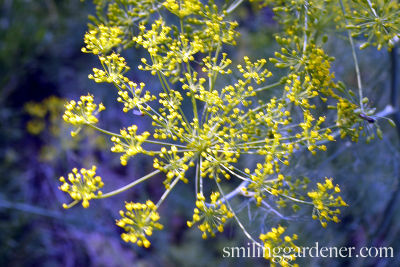 Phil: Yeah and yet the thing I like about fennel too is in the garden, it’s just a great plant for attracting beneficial insects, it may be a perennial where you live so it comes back every year or even if you live in a cold climate, it will self seed quite readily and same with dill, it’s related to dill. So I actually tend to grow more dill because I like it a little bit better in cooking but more of a medicinal plant is the fennel and yeah, I think that’s the one we wanted to cover. So we had a question we were going to ask people? H: Yeah, we were going to ask you guys — why do I always forget these questions? H: Yes, I think I even wrote it down. Phil: You know like what’s medicinal about it and just tell us whatever they want about it because obviously there are tens of thousands of these; we just took five. So we’d like to hear what plants, yeah, people like to grow. Phil: Yeah, so if you are not on the blog, check it out because one weed that we wrote about is one that I sometimes use in this ice cream that I make. So I have a little recipe for that on the website too. H: Cool! All right, see you guys. This made us think about the natural medicines of plants. Plants are full of compounds and energies that can improve our health and even heal us in miraculous ways. Like the lady who provided the candy for her grandson, plants are the original providers of all our drugs. Are you growing fruits, vegetables, herbs, nuts, seeds and mushrooms in your organic garden? And using important soil- and ecosystem-building methods in order to grow the most nutrient-dense plants possible, like the methods I teach in the Academy? If so, you’ll be getting natural doses of the same medicines that are used in common over-the-counter drugs, but you’ll be bypassing all the bad stuff that results from using synthetic versions of these compounds. When you do that, all food plants you grow will be medicinal in that they provide you with vitamins, minerals, antioxidants, enzymes, etc. to help you be healthy and disease-free. But there are some plants that are especially medicinal. What follows is a list of 5 easy-to-grow, common medicinal plants I have in my garden and have actually used in the last week. If you’re in a temperature climate like the U.S., you can probably grow them, too. Kale gets a top spot on our medicinal plants list since it has so much to offer. And it’s super easy to grow. It has fiber, minerals (lots of iron, calcium and magnesium), vitamins (especially A and C, which are both immune-boosters), antioxidants and essential fatty acids. Not to mention protein – 20% protein by calories! Massage it with salt before you use it to turn it from a somewhat unpalatable leaf to a tender, delicious salad green. I didn’t really enjoy kale until Heather taught me that trick. And go for other brassicas like broccoli, cauliflower and cabbage. They all have a high level of sulforaphane – a really powerful cancer-fighting compound – and other antioxidants. 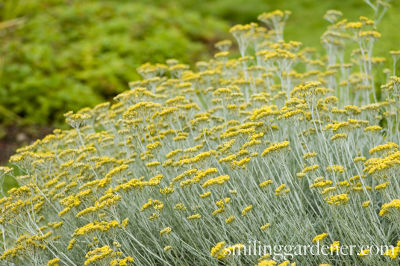 This is a great herbaceous perennial to include as part of your medicinal plant list. It has long-lasting flowers which attract loads of beneficial insects and it looks beautiful in the garden. Yarrow has a long list of medicinal uses. The leaves are used as an astringent to stop bleeding and close up wounds, so it’s great for cuts (like when you stab your hand with a thorn from a red currant plant). Making it into a tea can provide benefits to your tummy by stimulating digestion (and helping with menstruation for the ladies). To make the tea, harvest the leaves before flowering and then dry them. This is another species which will attract butterflies and other beneficial insects into the garden, and it’s a perennial that self seeds, so leave a few flower heads there to drop. It’s most famous for aiding digestion. Ever wondered what those seeds are you get after your meal at an Indian restaurant? Fennel! The seeds are easy to harvest (just cut and dry the flowers heads) and can be munched on raw or made into a tea to enjoy after a meal. The seeds are also perfect for freshening the breath so keep a dish around the house and eat a small handful as you please. 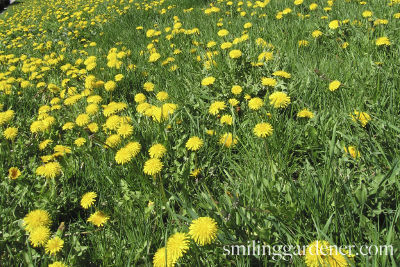 I know dandelions are weeds in the lawn, but they’re also nutrient accumulators, meaning their roots seem to help pull up minerals such as maybe calcium and potassium from down in the soil. Different parts of this medicinal plant can be harvested for consumption. The root of the plant is useful to improve digestion, and also as a mild laxative. Every day, I use sprouts and other herbs – sometimes including just a small amount of baby dandelion greens – to make my version of ice cream. Per person, put 1 frozen banana, 1/2 cup of frozen berries (raspberries are the best), 1-2 cups of sprouts/greens and probably 1-2 Tbsp of water or EM or aloe vera juice into a food processor, blend them up very well, and eat. When you get the texture right, it’s almost as good as real ice cream! Just dry the root and make tea, and same goes for the leaves. Or eat the freshly harvested leaves in a salad or smoothie. The leaves are full of vitamins, iron, beta-carotene, fiber, calcium, phosphorus and on and on. Plus they’re a good source of protein. 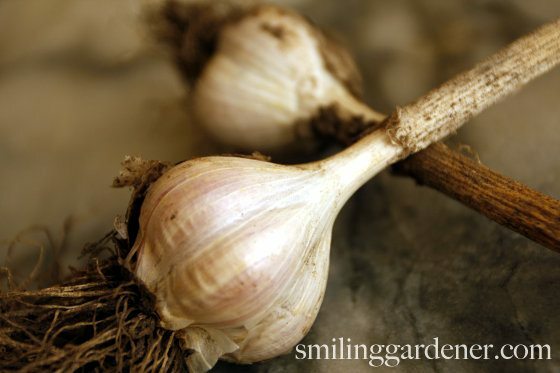 Garlic is another deserving member of our medicinal plants list. 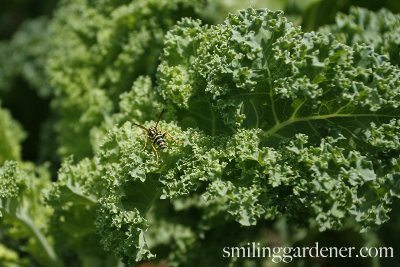 Not only does it attract beneficial insects, but it also repels some not-so-beneficial insects, so using it around your organic vegetable garden is great. It’s a known antibacterial, antifungal and antiviral and also is said to help prevent some cancers and heart diseases! And research suggests eating raw garlic will help to lower high blood pressure. Crushing or pressing garlic makes the enzymes and antioxidants more active and beneficial for you. The best part is, garlic is super easy to grow and can be used in numerous ways in your kitchen. I harvested my 150 bulbs last month for use over the next year. Obviously this is a very incomplete list of medicinal plants, but a good start to add to your repertoire. What other medicinal plants do you grow? Great information. My daughter studied a bit with a herbalist and your list would certainly agree with hers. There are a lot of other healthy ‘weeds’ to consider. I would recommend a little research as the list is extensive. I don’t use the term ‘weeds’ anymore because of the negative connotation “pioneer” plants is the new lexicon. I pull these ‘pioneers’ because I understand some give off a slight toxin to kill off their competition. I generally put what I pull in smoothies, lots of good trace elements. Agreed, pioneer is exactly the word. There are many medicinal “pioneers” out there. Hi Phil,I LOVE herbs and all their great uses; medicinal and culinary! I do think it is always important when we are talking about them to make a statement of possible contraindications that herbs can have; such as reactions with pharmaceuticals (increasing or decreasing the effectiveness, etc). Also they could cause effects that some may not want or even be dangerous. For example, I seem to remember reading something about yarrow, that for one thing it can cause lower male fertility or even cause miscarriage. Many herbs are recommended that they not be used by pregnant or lactating women. Keep up the great work! Thanks Kerry for a great point! I should have added that it is always a good idea for anyone who wants to begin to use herbs to do some research on their own on a particular herb. Identification is vitally important. Getting it wrong can be deadly. I heard of someone mistaking foxglove for mullein leaves… not a happy ending. I don’t want to discourage the use of herbs, do use them, but be careful! I say this as someone who LOVES herbs! Kerry, I agree that some plants are poisonous to animals and that is why I won’t grow them. Foxglove and other ornamental flowering plants are extremely toxic to horses, cows, and even deer. Although most animals won’t eat them I am not willing to take the chance. Good advice, Kerry. Thanks!!! Just wondering where Heather’s dandelion detox recipe is that you mentioned? Cayenne is great for seasonal allergies and as a compress for bleeding.Comfrey is good for digestion and some respiratory problems.Peppermint is also good for digestion. Mint tea is HUGELY popular here in the Netherlands. I have come to live by it!! Are you growing these things? I’m growing Passionflower and Mexican Mint Marigold for making calming tea, rosemary for rubbing on skin and scalp, and horehound. I would like to make my own lozenges with the horehound, but haven’t yet. Sounds great 🙂 You must be in a warm climate for all those heat-loving plants! I was wondering about someone who takes Warfarin ! Seems like he can’t eat most of what I call super foods? Nothing in the brassicas family! No dark green veggies but we do eat iceberg lettuse. Tried romain and that was too much. I think its vitamin K that affects the blood. Any ideas? I know Warfarin is for preventing blood clots, so if possible, it’s obviously always nice to live a lifestyle (eating, exercise, etc.) that makes it unnecessary to take the drug, but I’m in no way qualified to advise on that. I suppose he can eat iceburg lettuce because it’s so devoid of nutrients like vitamin k. What about sprouts? They are nutrient-dense, but perhaps they would be something to look into. That is really cool post. Very helpful and great links. I really learned a lot by reading this post. Thanks! It’s easy to grow curcumin. It’s a member of the ginger family, can be used like ginger in cooking, teas, or powdered and taken as a medicinal. In the fall as the leaves are dying, I harvest some of the tubers, leaving a few to start new plants. Each little” finger” can grow a new plant. Dry them a bit or freeze them, then use like ginger after peeling off the brown outer wrapper. Curcumin is Asia’s ancient “wonder drug.” It contains anti-inflammatory, anti-cancer molecules, and has been shown to have an effect of beta-amaloid plaques. I consume it for the sake of my brain which at 71 is still very sharp! Fish Oil works in conjunction with curcumin. Yes, if you live in a warmer climate, turmeric is a wonderful plant to grow! Of things I consider medicinal, I grow calendula, burdock, lavender, comfrey, nettles, milk thistle, and sweet annie (a type of wormwood). In my yard I forage (it grows of its own accord) for colt’s foot, plantain, yellow dock (root), dandelion, yarrow (the ones with the white flowers are most medicinal), and pineapple weed. Garlic actually makes me sick, but I might consider growing it for the other plants’ sake. I like to grow nettle, both for compost and as a very effective remedy for asthma. I blend the leaves and drink it. It tastes like spinach water and has no sting. And it is highly nutritious. I used to make it for my husband to drink before he went out and does a lot of yardwork (he got asthma when he mowed our lawn) and he never had a problem. Or for me if I was cleaning a dusty garage (I got it from dust mites), and I had no problem. Now neither of us get asthma; I don’t know if that is the reason — because the few times we drank nettle it cured us — or whether we just outgrew the tendency toward asthma. Nettle, if you will look it up on line, is a natural antihistamine. I urge anyone with asthma to try this. The stuff REALLY WORKS!!!!! It’s most likely the nettle. I’ve never heard of anyone outgrowing asthma. I’m not a doctor and can’t definitively say that, just my opinion. Thank you for your response. I don’t know why we no longer get asthma from the things that used to cause such a severe reaction in us, but it has happened — without the need to drink the nettle. I do anyway, on occasion, because it is nutritious. So happy for you both! Asthma can be debilitating. Elderberry was the 2013 herb of the year. After reading the book, and learning all its benefits and folklore, I now have a large elder patch in the back yard and looking forward to fall harvest. Yum.